I saw this ad over at Advertising is Good For You and I just love it. 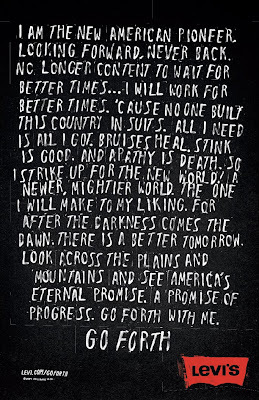 This is the can-do, moxie-filled spirit of our grandfathers. This is how our ancestors made the US great. They got off their asses and worked for it. And, in all liklihood, they did some of it wearing Levis. I can't believe I'm kind of inspired by a jeans ad. And there they were...Peter, Paul and Mary. I couldn't believe that after 20 years of life, I was finally hearing one of the most influential musical groups of my life. My parents and I were estatic, Handsome's less so, but still enthusiastic. It was truly one of the best concerts I've ever been to and when Mary sang "Where Have All the Flowers Gone?" there were tears in my eyes. I remember being in high school and their music took on such a different meaning as I was awakened to social justice issues. I remember the first time I sang "Puff the Magic Dragon" to Darling and how she giggled. There are SO many memories and reasons I would like to honor her for. Her music was such a part of my life that it seems amazing that the songs are now done. 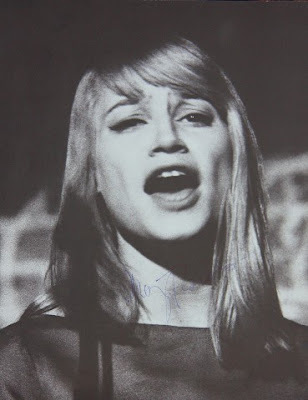 Rest in peace, Mary Travers. Thank you for everything. Wow! I saw these and thought they were a great, cheap idea for a really awesome dinner party. 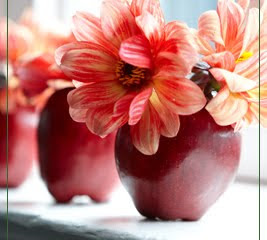 For short-term decorating, use sturdy apples like Red Delicious or Granny Smith to craft a cute bud vase. Simply core an apple as deep as you can, using a knife or a screwdriver. Keep your handiwork hydrated and fresh by spraying the inside and edges of the fruit with a mixture of water and lemon juice. Top with one large flower, or try a small bunch. Show off these delicious creations on a mantel, windowsill or atop a rectangular plate on the dining room table when entertaining. I've been on a reading jag. (As a result my DVR is almost 75% full. Yikes!) This happens from time to time and is usually because I've started a really fabulous book. While I read almost anything under the sun, I've hit on a couple of really great historical novels lately...neither are new releases, but they're new to me, so there you go. For really great book reviews, go visit Heather J. at Age 30+: A Lifetime of Books. The basic premise is "What if the Nazis won the war?" Not a unique pastiche, many people have played this "What if" game. Turtledove does it splendidly though. You follow the members of a secretly Jewish family, the Gimpels, and their Jewish and non-Jewish friends as they navigate the changes that follow a new Fuhrer being named to the head of the German Empire. I liked Turtledove's imagination concerning how the world would be different at the beginning of the 21st Century. At times it was eerily chilling: After the 3rd World War in which the Nazis used nuclear bombs on Washington, DC and Philadelphia, Omaha became the new capital, the destroyed Liberty Bell was in Berlin on display, but sealed to protect from radiation. 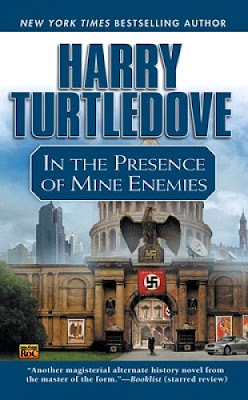 I also liked the different perspectives through which Turtledove tells his story. From children in school, to Heinrich and Walther who work in the heart of the Reich, to an outspoken English professor, Susanna, the secret story of Jews in this strange new world is fascinating and at times heart-wrenching. Very little. I thought at times Turtledove's writing mechanics were a bit elementary and maybe a bit awkward, and I didn't like the longer, somewhat laborious descriptions of playing bridge with their Aryan friends. I also was waiting for deeper emotional conflict/turmoil between the leading characters, but didn't feel like it ever came even after certain members of the family were arrested by the Nazis. But, overall, it was worth my time to read through to the end. A friend handed me this book and said, "You HAVE to read this! You'll love it!" knowing that I am a big fan of books such as The Emancipator's Wife: A Novel of Mary Todd Lincoln. I sat down one evening after Darling went to bed and thought "I'll just read a few pages and see"...Three hours later I look up at the clock and realize I'm half way through the book. 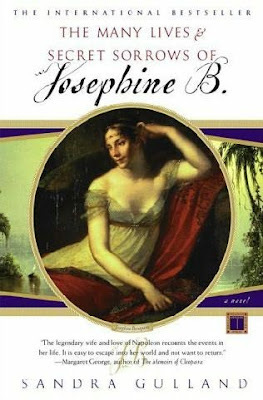 As the first in a series of three books, The Many Lives takes the reader on a fascinating journey through the life of Josephine (Rose) de Beauharnais from her birth as Marie-Josephe-Rose Tascher in Martinique on a sugar plantation through the wild days of her unhappy first marriage and The Reign of Terror to the very beginning of her fateful relationship with Napoleon Bonaparte. I loved this book! I know a pretty fair amount of French Revolution history, but I never knew much about Josephine Bonaparte before her marriage to Napoleon. The story is told through "diary entries" and "letters" and since it is about a historical figure, I appreciate that they were dated so I could tie them to a bigger perspective. I have no idea if it was true or not, but I found the prediction from a slave that she would be unhappily married, would then be widowed, and would then become queen really interesting. The novel is supposed to be relatively historically accurate and that's always a bonus for me. Now I just need to get the other two books!! Um. Not much. I really enjoyed the voice that the character of Josephine had and I appreciate that it's not just a bodice ripper in an historical setting, but I wish it revealed a little more of the actions of her first husband, Alexandre, who played a pretty big role in the early Revolution. Also, at times, I feel as if the book has pacing issues. While it is undoubtedly a quick read, sometimes the story jumps ahead really quickly and you feel as if you might have missed something that happened in between and you wonder what the writer left out. Also, and I'm not sure if it can be helped since the story is told in diary form, I wonder whether the casual reader understands exactly what is going on during certain periods of the French Revolution. Any way around it, I'm eager to read the other two books. I really enjoyed these books and I would encourage you to check them out. If you have any good historical fiction suggestions, send 'em my way! I don't remember everything, but I do remember that in my dream she held my face in her hands and said "I love you, doll baby". Just like she did a thousand times in real life. My grandma was the original Moxie Mama. Her Brooklyn sass inspired me so much to be a bold, brave woman. I just wish I could hug her one more time. I hate spending the day with tears in my eyes, even though it's been 8 years. Well, what does she do with them? What does the Tooth Fairy do with the teeth? 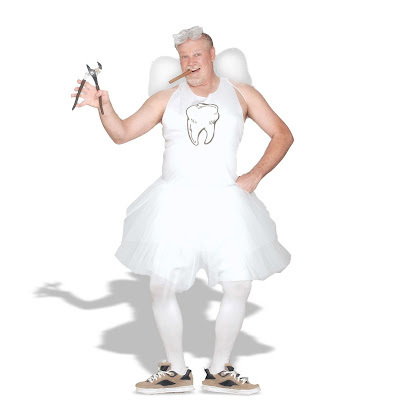 And the more I thought about it, the creepier the whole notion of a Tooth Fairy became. Some fairy that sneaks into your room while you're asleep to take your teeth for unknown reasons and to leave you a couple of bucks for them. As soon as the ink was barely dry on our renter's contract at the house of horrors, our land(slum)lord gave the five of us college students a sickly, sweet smile and said, "Be nice to your neighbor lady. She'll call me in two seconds if you're doing something she doesn't like." We should have known then. The day we moved in she was sitting on her screened in porch with her 5 small, yapping dogs, watching us. She came over to introduce herself, we'll call her Bette because you better believe we weren't sorry to move away from her. The very first thing that came out of her mouth is, "I called _______ your landlord and found out about you. I'm just glad you're not illegals who will play their 'taco music' until 2 in the morning or druggies or Africans. One black guy who lived in your house grew pot on the second story balcony. (This is foreshadowing because we actually had a roommate that would attempt that a year later, but he wasn't a very good botanist). Anyway, I just wanted to let you know I'll be watching you." I swear this is a direct quote. Needless to say, our liberal arts college minds were blown by this narrow-minded, bigoted, little old lady. I don't think any of us had ever heard anybody refer to minorities like that out loud. We were white-bread, protected kids from the suburbs. We were in shock. As it turned out, we had some pretty wild parties there and Bette never said a word, mostly I think because at least we were white and weren't going to steal from her. Bette had lived in the house her grandfather built around the turn of the twentieth century and she knew at least 60 years of gossip for every house on the street. She was more than willing to share her stories which kind of fascinated me as an historian and bugged on the level that it just proved she had about 70+ plus years of snooping and gossiping under her belt. God only knows what horror stories she told the next people who moved into our house. I just found out that I have been named Best KC Mommy Blog (a dubious honor) by Kansas City's Best Blogs. While I shun the "Dooce"-like title of Mommyblogger, it's nice to know The Editors (whoever they may be) know what the difference is between a "look at my kid" blog and a mother who happens to blog. This has totally made my day!! !